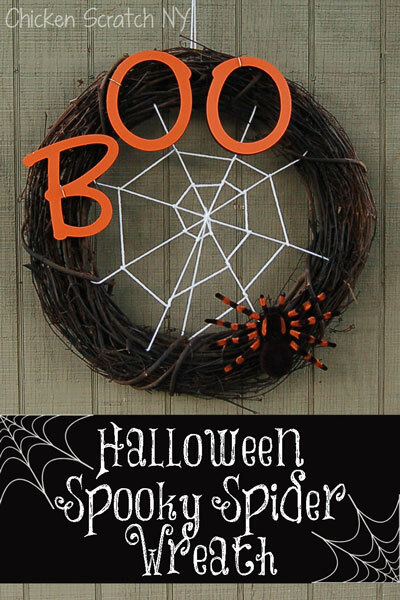 I wanted to make a fun Halloween spider web wreath that wouldn’t take a lot of time. You should be able to put this together pretty quickly if you have all of your supplies together. If not, it’s only a Michael’s trip away! 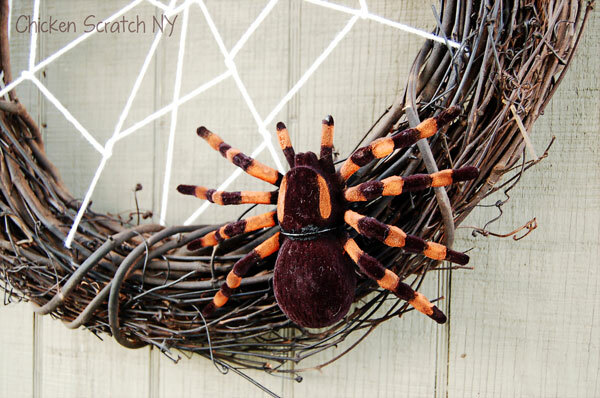 The real star of this show is the spider web, if you’re hanging your wreath over a white door or wall switch the yarn to black so it shows up. You can also change the message. I think EEK! would be just as cute as BOO and that was actually my first choice.Unfortunately they were a bit short on E’s at the store. 1. Get all of the painting out of the way first. Start by painting your letters, I did orange on the front and black on the sides. 2. 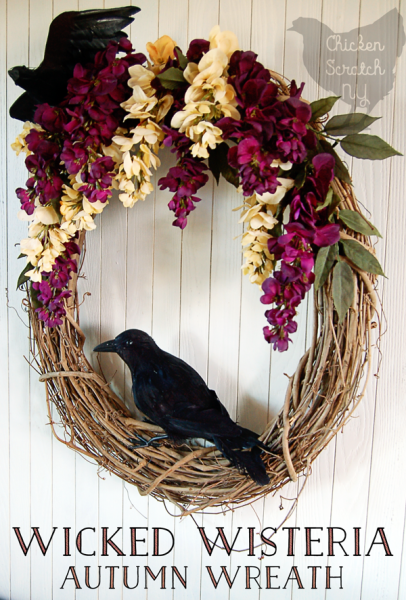 Give the wreath a quick blast with the black spray paint. You don’t need the wreath to be solid black, just darker. 3. You can also paint the spider, the one I found was black and brown, I covered the brown parts with orange paint. It took a few coats to get a bright color on the flocked spider material, it could even use a few more coats. 4. 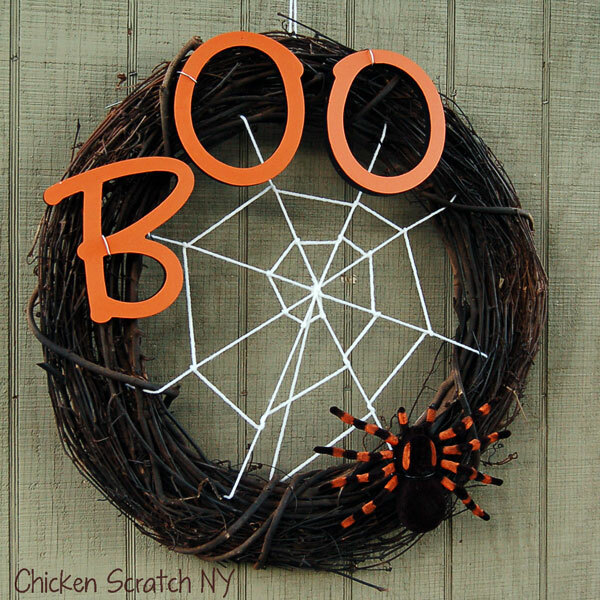 After making double sure your wreath is dry make your spider web by weaving the white yarn through and across the wreath. 5. Use your hot glue (assuming your dog didn’t chew up all your glue sticks) or floral wire attach the spider and the letters. The spider really is black in real life, but he keeps turning brown in pictures. Hang up your wreath and you’re good to go! I’ve made so many Halloween Wreaths over the years but this is one of my favorites, I’m a sucker for spiders. I love this! So smart to paint the spider!! I love this! It is so cute how you created the web. 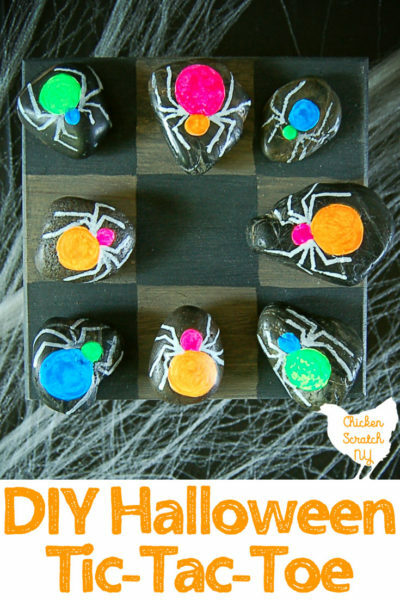 I think this is an adorable and tasteful way to decorate for Halloween! Very cute! Hope your kitten is doing better! Can you tell me what size letters you used please?